The easter bunny appears; pumpkins are carved and snowmen cover the windows of the city. It’s usually pretty clear when a big holiday is around the corner. And no matter what holiday that is, as a business you need to cash in. 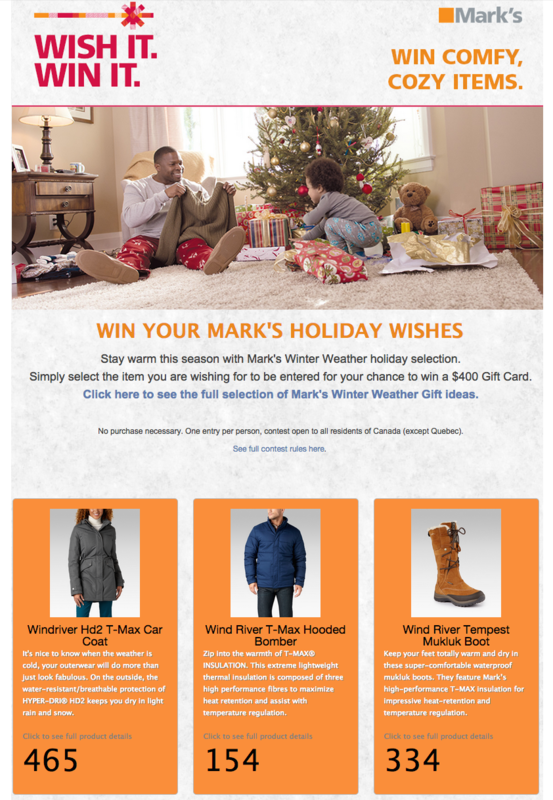 A holiday contest is a fantastic way to engage users and get them excited about your brand. Thanksgiving, Easter, Mother’s Day, the Superbowl, or even Earth Day, holidays and celebrations provide you with the perfect opportunity to run a contest. But where exactly does the value lie in a holiday contest? Let’s find out. As a business, you must know that holidays = cash. But in order to get that cash, you need to get current and potential customers interested in your products and your business. A holiday contest is the best way to do so. An online contest provides incentivized interaction to your business (both online and in-store) while also generating you leads. The theme aspect allows you to tap into something that is relevant to all potential and current customers. The contest gives you a new email list while also engaging and interacting with existing customers or leads, bringing your business back to top-of-mind awareness. Going into most holidays, you can’t walk more than a couple feet without being bombarded with some type of advertising. Whether it’s a tv commercial, a bus ad, or a Facebook Ad, marketers are fighting for a bite out of the consumer’s wallet. So with all of the competition, how can your business stand out? A contest gives you that advantage over the competition. Instagram Hashtag Contest - Possibly the most popular contest type in recent months, an Instagram hashtag contest lets participants enter the contest simply by posting a photo on their Instagram account, tagging it with a specific hashtag unique to your business. The pictures are then displayed in a gallery on your website or Facebook page where users can vote on them and share them with friends or family. Sweepstakes - If you’re looking for a high volume of participants, a sweepstakes is a great way to go. A holiday or event-themed sweepstakes promotion lets participants simply enter their information on a form for the chance to win a prize. It requires very little effort but can help you build your fan base and email list. Check out our article on how to run a sweepstakes. Photo Contest - Visuals are much more effective in engaging fans than simple text, so a photo contest is the perfect way to capture holiday cheer and excitement. It involves participants uploading a personal photo as well as their personal info. These photos (a form of user-generated content) relating to your brand can then also be used as marketing content in the future. Vote Contest- A vote contest lets you upload the ideas and images, getting the participants to simply vote for their favorite in order to be entered to win. It gives you insights into your current and potential customers likes and gets them interacting with your business and products. Sometimes reading an article about a topic can give you the guidance you need to try out a new strategy, but I think examples are the best way to gain some inspiration. So take a look at these successful holiday-themed contests to get your mind swirling with your own ideas! This Christmas contest from Mark’s allows them to display their winter products and get consumers thinking about what is on their wish list. It brings the brands and their products top of mind and creates a sense of desire, possibly leading customers to realize they want to purchase. The holiday theme is relevant and gets customers in the holiday mood while still think about Mark’s. 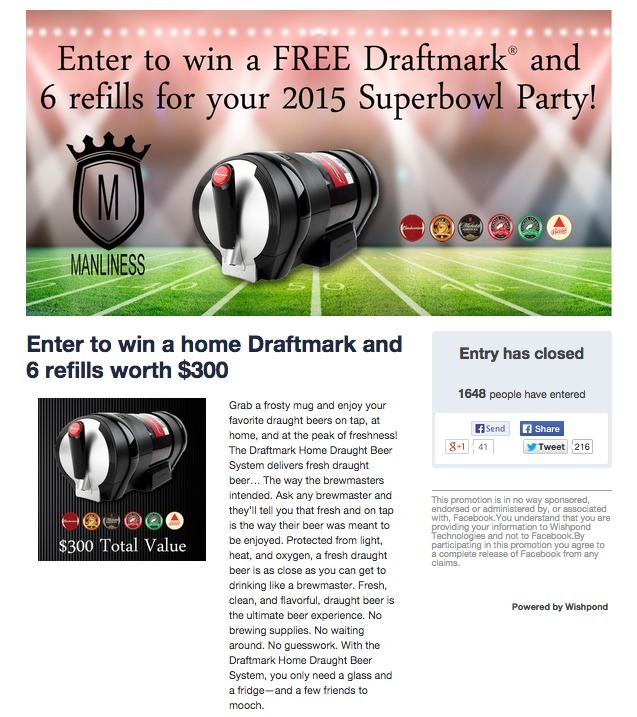 This sweepstakes from Manliness Magazine taps into the Superbowl theme and presents the perfect prize for their target audience of young, athletic males. What goes better with football than a keg of beer? This is the perfect themed event for the magazine to engage with readers and get them entering their personal info. It also got 1,648 entries for a 46.83% conversion rate. A contest touchdown in our books! Back to school is a hectic and expensive time of the year for all families. 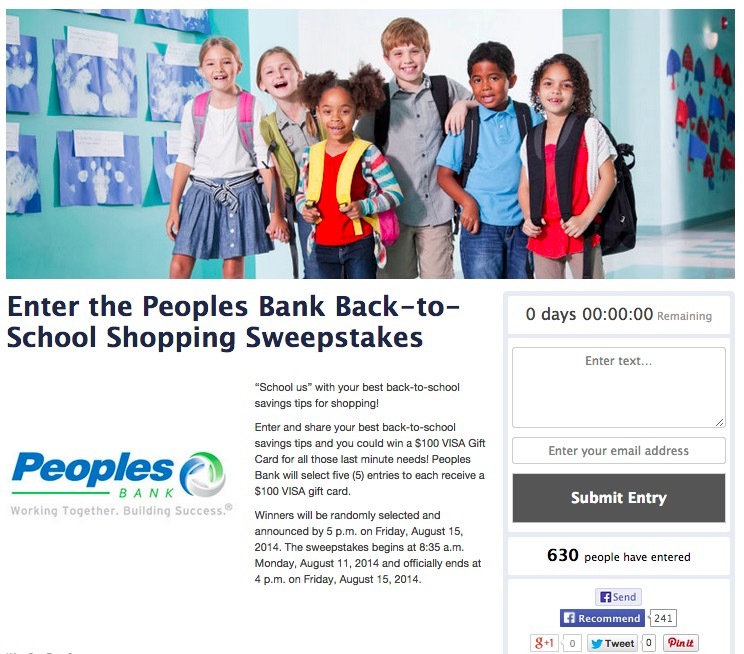 So why not run a contest and get parents or students thinking about free cash? This sweepstakes has a simple theme and requires participants to write a short paragraph about money-saving tips. It generated 630 entries for a 24.04% conversion rate. Not too shabby for a $100 dollar prize. Furry friends are the perfect subject for a photo contest. 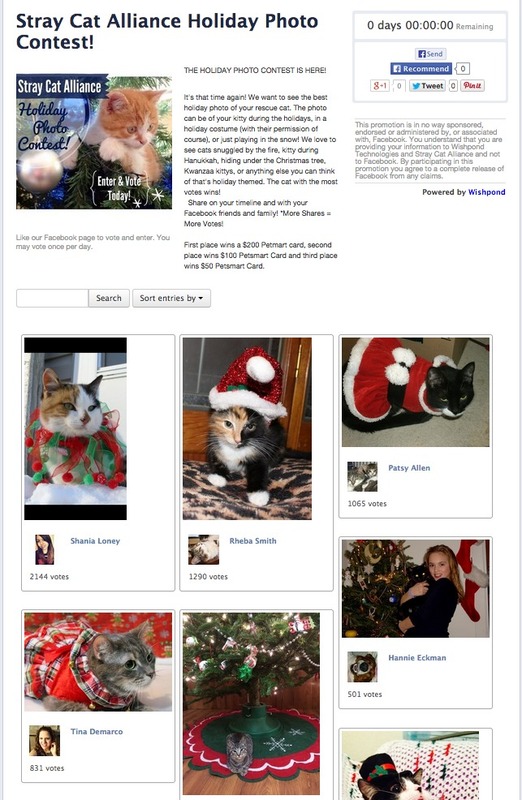 And a holiday themed pet contest is one sure way to drive entries. This holiday contest is relevant and gets partners or past clients sharing photos of their rescue cat at a special time of the year. A photo contest is the perfect idea when involving things like babies or pets, as who doesn’t love to vote on cuteness? Along with the winter holiday season comes a lot of holiday treats, so jumping on the fitness bandwagon in the new year is a great theme idea. 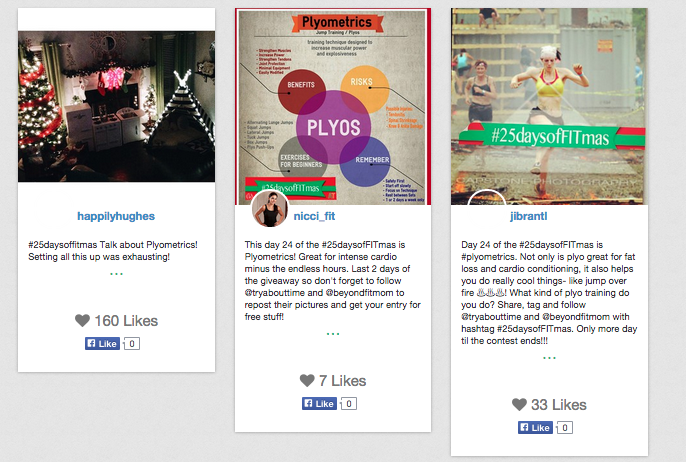 This Instagram hashtag contest gave participants the chance to win fitness prizes every day simply by following their accounts and uploading their Fitmas photo to their Instagram account (as shown below). A hashtag contest like this also expands the reach of your business to new potential followers and customers as participants share their photos with their own networks. 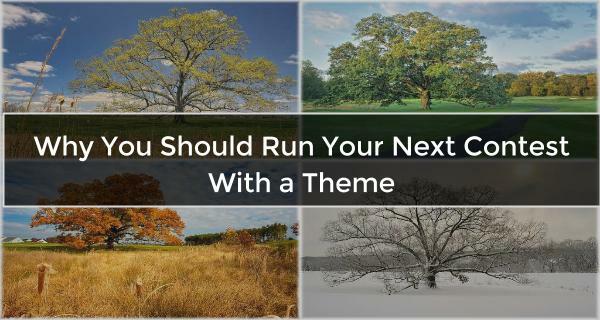 So what holidays or events should you use as the theme for your contest? Holidays or seasonal events, no matter what they are, bring people together and get them in a happy, joyous, sharing mood. A contest is a great way to get fans and customers engaging with your brand during these busy times with a theme relevant to the time of year. Have you run a holiday contest? Which holiday has gotten you the best engagement or most entries? Share your experiences with me below, I would love to hear them!